A man standing in a homestead wearing barkcloth, with a hut in the background (type known as gbuguru) storing a wooden gong (gugu) under the eaves. Manual Catalogues [typewritten, entitled "Zande Photographs (E-P)"] - 347. 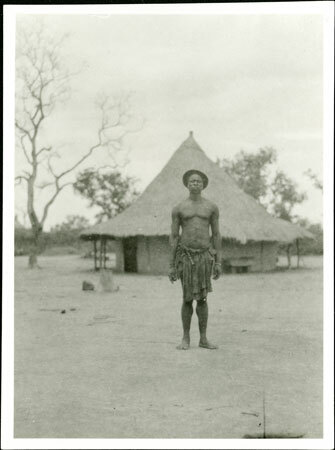 Man standing in front of hut (shows type of hut). (Poor photograph). 61/2 (111). Morton, Chris. "Zande man in homestead" Southern Sudan Project (in development). 03 Jan. 2006. Pitt Rivers Museum. <http://southernsudan.prm.ox.ac.uk/details/1998.341.347.2/>.